All nine Justices of the United States Supreme Court were present to swear in Attorney Parese during an admittance ceremony within the Supreme Court. This prestigious honor is held by only a small percentage of all practicing lawyers in the country. As someone who has been sworn into the U.S. Supreme Court, Attorney Parese is truly ready for anything an opponent may throw at him. Legal cases can be appealed multiple times, with each appeal going to a higher court of authority. The highest court in the land is the U.S. Supreme Court. With Parese's admittance to practice before the Supreme Court, he can represent a client all the way to the top, if necessary. 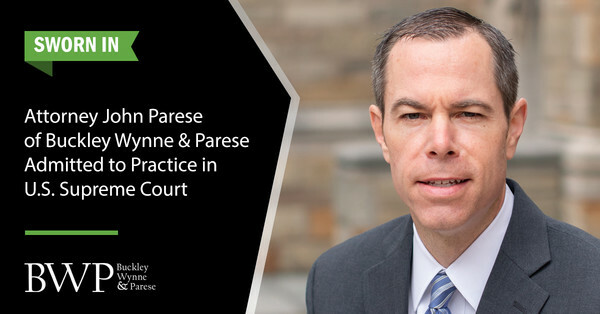 In addition to being sworn into the U.S. Supreme Court, Attorney Parese has earned numerous other titles and awards to date throughout his significant legal career. He is a former President of the New Haven County Bar Association; a James W. Cooper Fellow for the Connecticut Bar Foundation; for over a decade he has served as General Counsel to the Auto Body Association of Connecticut; and he holds an AV Preeminent Rating with Martindale Hubbell. People who come to BWP for representation know their case will be in good hands with Attorney John Parese or either of his equally accomplished partners. To learn more about Attorney Parese, you can visit his attorney profile page. To begin a free case evaluation about a personal injury claim or complex litigation case of your own, you can call our New Haven trial attorneys at 1-800-445-2278. You may also use an online contact form or 24/7 live chat.